Halloween 2017 Kid’s Costume this year! I have all things figured out since last Halloween of what my kids going to wear. Of course, the little one will always or has to wear the hand me down costume of his Kuya when he was his age and thank goodness for the safety plastic bags that keeps the clothes clean and new the little one’s costume still looks brand new. Mind you it is 4 years old now. 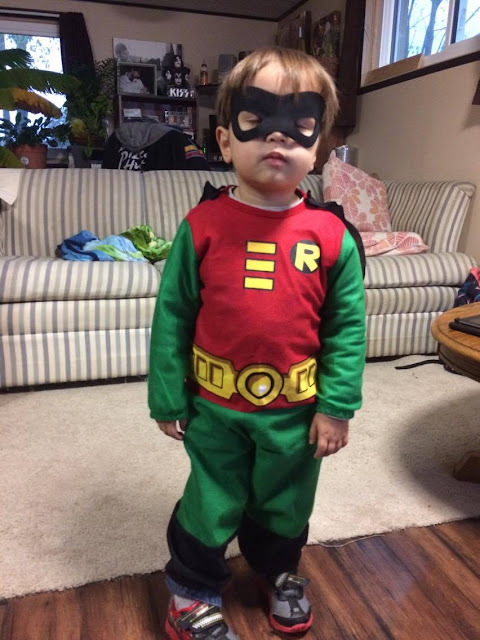 Kuya K has worn it when he was 3 years old and now our little one will turn 3 on December yet, he is big enough to wear the costume, in which I find it just perfect for him to be Robin. Caleve is a Robin or the Captain of the Teen Titans Cartoon Character. I’m happy that he wore the mask. And that he was all dressed up when I got home from work. Very excited to walk for a trick or treat. Kuya wished to be one of the Avengers and so it was also a perfect timing when I went to Walmart to purchase an on Sale Costumer for him. It was 50% or 70% off of that time, I can’t remember and I’m not buying something that he will only wear once or twice for a full retail price. I’m cheap when it comes to this product because they are expensive if you don’t wait until clearance or when they become Sale, which I can get 90% off or free. Captain America is missing his Shield, I totally forget about that until my Papa mentioned where is his Shield? It wasn’t included in the costume when I purchased it, also it was lame of me not to make him one. My Papa suggested to use a lid of a wok instead, but I have not time to make it anymore. 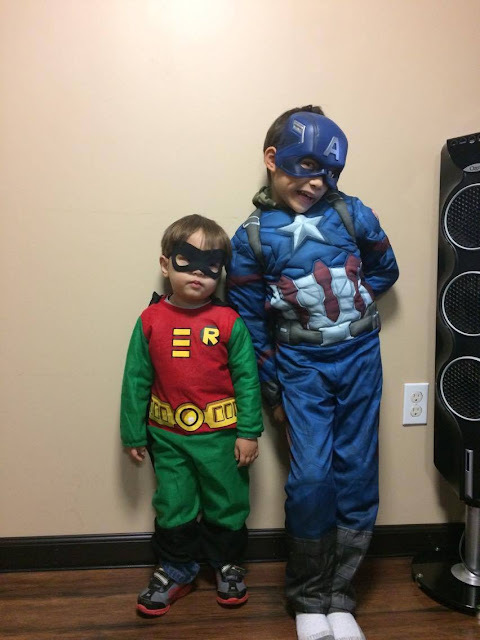 The good thing is that they don’t have enemies that day, for my son to use the Shield….lol! And as for Pretty, it was un-intentional for her to join the trick or treating. Yet, I’m happy that she put on some makeup and became a Wicked Witch. We don’t have a costume for her, but she did wear a black clothes after all. 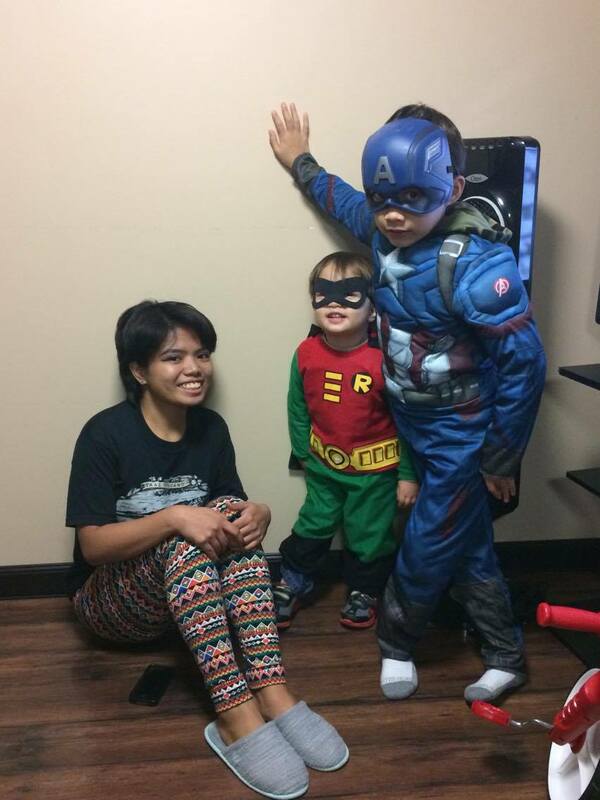 She joined the gang for a trick or treat house to house, never intended to join, however, everyone kept asking her if she would like some candies, and that’s when she decided to just go trick or treating with the boys. They got lots of candies, but not as many as last year. Of course, it didn’t help when the weather outside was 43F cold and windy. The fun thing is that even though they went home early, they go house to house for a trick or treat candies also it was Pretty’s first time to go trick or treating.